The wrist comprises of several small bones collectively known as the carpal bones. The carpal bones are interconnected via strong ligaments and connective tissue known as the flexor retinaculum. Collectively, this arrangement forms a space known as the carpal tunnel. The median nerve lies within the carpal tunnel and is responsible for supplying some sensation and motor control to the hand. 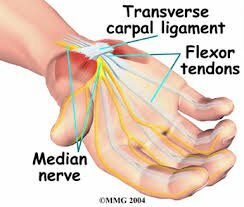 Occasionally, the carpal tunnel may narrow resulting in compression of the median nerve. When this occurs, the condition is known as carpal tunnel syndrome. Most patients with carpal tunnel syndromes, tennis and golf elbow, not only have compressive lesions at the wrist or elbow, but they also have involvement or damage at the level of the cervical spine. It is important to evaluate the cervical spine as well as the wrist. For more information please schedule an appointment with our chiropractors or give our chiropractic office a call today.